Organic Eggs? 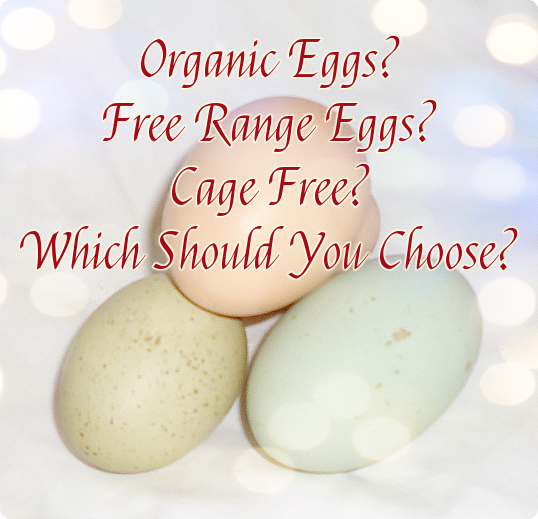 Free Range Eggs? Cage Free? Which Should You Choose? If you’ve become interested in improving the kinds of foods you eat, eggs are probably one of the foods you’ve taken a good look at. There are options out there for those who want better eggs. The hard part is figuring out what “better” really is. Now my personal favorite eggs are the ones I get from my sister once in a while. She doesn’t live close enough that we get them often, but she has backyard chickens. They roam the yard during the day, eating what they find, plus the scraps the family gives them and the chicken feed my sister uses. I don’t know all the details. I do know the shells are much stronger than the shells on grocery store eggs, and there is a visible color difference in the yolks. But not everyone has access to backyard chicken eggs even part of the time. It’s worth looking at your options and really knowing what all the terminology really means, because it’s not necessarily what you think. Note that the color of the eggshell really doesn’t matter. My sister’s chickens product brown or green eggs, depending on the breed, but there’s no difference in the quality of the eggs due to their coloration. Cage free chickens have things just a little better than your standard caged chicken. They’re usually in a building full of chickens, crowded, but they can at least walk and stretch their wings. They probably don’t go outside, however. They probably do get treated with antibiotics. It’s an improvement but not much of one. This one doesn’t usually mean what you think it means. Take your cage free chickens and give them a little access to the outdoors. This does not mean they have access to pasture where they can eat grass and bugs. There are no rules about how long each chicken gets outside. Organic chickens can usually go outside some, and they cannot be treated with antibiotics. They are also give organic feed. The facilities are inspected annually by an agency with USDA accreditation. Pasture raised chickens lead the kind of life you’d think free range means. They have free access to come and go from their coop, and can eat grass and bugs as they find them. They are usually given organic feed and not treated with antibiotics. This is as close as you can get to raising your own chickens in the backyard. School is starting today here, and that means I have to think about what my kids will eat for lunch at school again. They aren’t much on cafeteria lunches – unless it’s Friday, which is pizza day. Overall, however, I prefer that they bring lunch so I know they’re getting good food they like. Our school isn’t too bad on that front; they have a small salad bar in the cafeteria, but I like providing healthy options myself. Not all these suggestions are entire lunches on their own. Think about what it takes to make a balanced lunch that your child will eat. There’s little point to pushing foods your kids won’t eat – it’s all too easy for children to throw out foods that don’t appeal to them or their friends. Also remember that some ingredients are healthier than others, such as whole grain versus white breads. Homemade pizza can be about as healthy as you choose to make it. A tortilla makes a quick, thin crust, and from there it’s up to you to make it good. 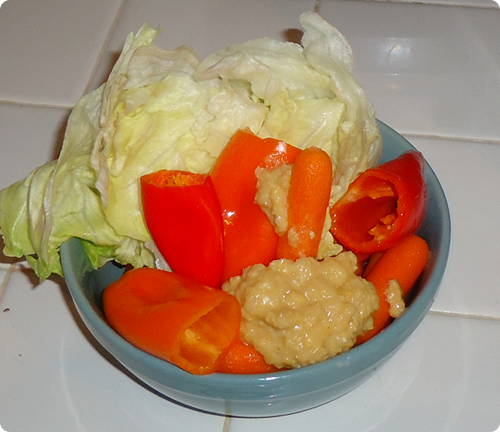 Fresh vegetables with hummus can be very satisfying in a lunchbox. A little feta cheese is a nice addition if your kids like it. Peanut butter with apples or celery is something of a classic. It makes a nice switch from your standard peanut butter and jelly sandwich. Take a look at any Lunchables or similar that your child loves. Can you make something similar but a bit healthier? Do it well and your kids will love it. Homemade soup is wonderful when the weather cools off. Pick one your kids love and put it in a thermos. One of my kids loves homemade soups, but the other is demands the canned stuff. 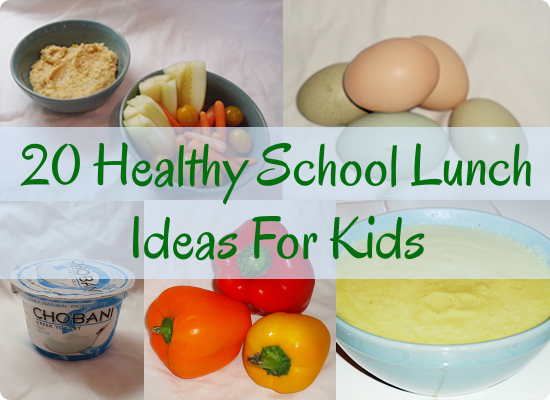 A hard boiled egg is a simple way to get protein into your child’s lunch. Combine cooked couscous with some vegetables, maybe some dried fruit or feta, and you have a nice couscous salad. You can use quinoa rather than couscous if you prefer. A wrap with a good quality lunch meat, some cheese, spinach or whatever else your child will enjoy makes a good lunch. Look for something better than the standard processed lunch meats. Skip the yogurts aimed at kids, especially the ones in those plastic tubes. They usually have far too much sugar and artificial colorings. Look for Greek yogurt or other live culture yogurts with real fruit for flavoring. Make a parfait with some granola and fruit to make it more interesting. For those mornings you’re running a little behind, you can always count on the classics. Pick a healthy bread if your kids will eat it. You may want to consider using a fruit spread rather than jelly to cut down on sugar too. But the real beauty of this is that you can make several ahead of time and freeze until you need them in a lunchbox. An improvement, in my opinion, on rice and beans, but made much the same way. Not a lunch in itself, but a wonderful addition to satisfy that urge to have something sweet at lunchtime. Give your kids a surprise with waffles for breakfast. A nut butter spread will help make it more filling, along with some jelly or a fruit topping. You can have a salad be a side dish or bring it up to a main dish with some chicken or other protein. Watch how much salad dressing you include, as it’s easy to go overboard. Feta and dried cranberries go well in many salads. If your kids are bored with regular sandwiches, switch to pita bread. Many love pita bread, and you can make most of your regular sandwiches in it. You may have to check school rules on this one, as nut allergies have led some schools to ban certain nuts. What veggies do your kids like. My youngest has a big thing for bell pepper, and all my kids love carrots. Slice up your kids’ favorite vegetables for a great addition to their lunch. Use muffin pans to make these frittatas the right size for school lunches. Line your muffin pan if you want to make things simple, or use a cooking spray so these come out easily after cooking. Lightly saute whatever vegetables you want to add. Beat the eggs and add in the vegetables and maybe some cheese. Scoop into muffin pan and bake at 350 degrees F for 20 minutes or until done. Make burritos with beans and cheese, or add other ingredients to delight your children. A mild salsa can really bring out the flavor. What did you have for dinner last night? Will it make a good lunch as is, or could it be made into sandwiches? Leftovers are a big problem for many families. They just sit there, unwanted, until they rot and get thrown in the trash. It’s a big source of food waste, but it doesn’t have to be. 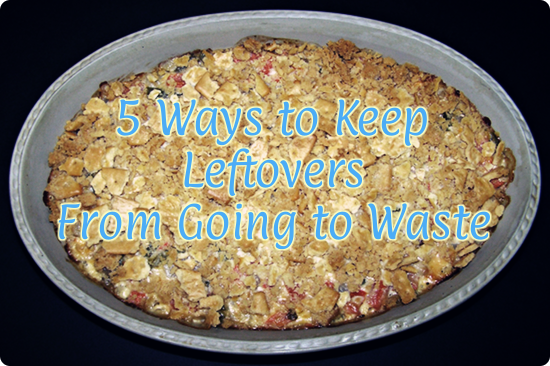 Here are some ways you can keep more of your leftovers from going to waste. 1. Freeze them for work lunches. This only works for foods that can cope with being frozen and reheated, but it’s a great way to save on lunches for people who work outside the home. Freezing allows the food to stay good for longer, so no one is stuck with having the same thing for dinner one day and lunch the next. 2. Add them to other foods. You don’t have to serve leftovers as is. Some can be combined into other foods to make them more appealing. Think soups, salads, sandwiches and stir fry. Not every leftover can be worked into something else, but it relieves the monotony of eating the same thing over again when it does. Don’t let your leftovers get shoved to the back of the fridge and forgotten until the next cleanout. Keep them where you can see them. Mark them with the date the food was made so you don’t have to guess whether or not it’s still good. If leftovers are getting out of control, declare a leftover night rather than cook something new for dinner. 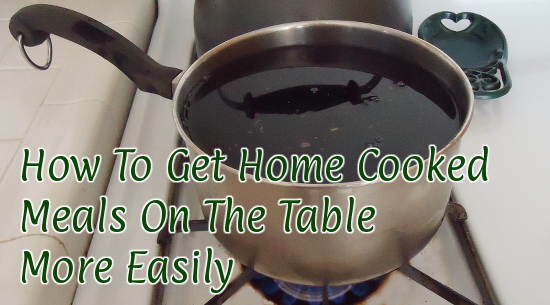 Anyone who is capable of reheating their own food can select their own meal this way, and the cook gets a little more time off. 5. Just eat them yourself. Sometimes it’s not worth the trouble reminding people that there are leftovers available. As you remind others to consider eating the leftovers, remind yourself too. 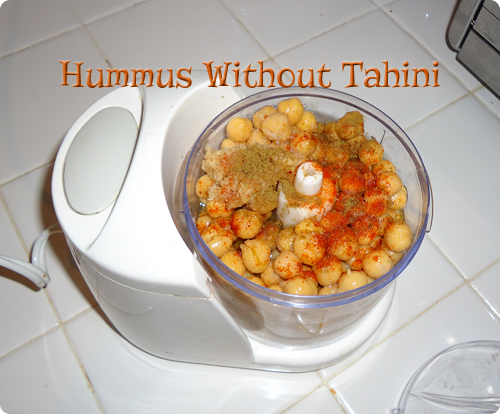 Okay, so hummus without tahini isn’t exactly the way it’s supposed to be made. But if you’re like me, and no one locally carries tahini, but you’d like to try making your own hummus, you have to look at the alternatives. You do without. It still comes out pretty well. I use a fair amount of lemon juice and a few spices to bring up a good flavor. There’s a lot of flexibility here too – more garlic, maybe some artichoke hearts, more or less of one spice or another. Hummus is easy to make. Throw your ingredients in the food processor or blender, and run it until you like how smooth it is. As you can see, it just fits in my food processor. It’s easier to clean, so I usually use the food processor rather than the Vitamix for hummus. Doesn’t come out quite as smooth, but still very good. Add all ingredients to blender or food processor. Mix until smooth. Consider adding artichoke hearts, roasted red peppers or sun dried tomatoes. Use as a vegetable dip and enjoy! Published by Stephanie, in Recipes.